Directed by debutante filmmaker Rakhee Sandilya, Ribbon is a story of a modern middle-class couple, Sahana and Karan, living in Mumbai. The film stars Kalki Koechlin and Sumeet Vyas in the lead roles. Ribbon is co-written by Rajeev Upadhyay and Sandilya herself. Sahana and Karan are both career-oriented individuals trying hard to work their way up the corporate ladder. We are first introduced to Sahana while she is undergoing a routine medical checkup. After seeing her test report, the doctor reveals to her that she is pregnant. The news of her pregnancy comes as a great shock to her and she immediately runs to see her husband at a construction site he is supervising. She tells him that she doesn’t want the baby, fearing that it may halt her career growth. After a series of altercations, the couple decides against abortion. What ensues is a topsy-turvy journey for the couple as they come to terms with challenges of raising a child in a cutthroat and volatile world. Rakhee Sandilya has shot Ribbon in a documentary-like style using a handheld camera that allows the viewer to be an unobtrusive observer throughout the movie’s runtime of 100 odd minutes. Since the film is supposed to document life in its essence there is bound to be many moments of monotony and very few moments of melodramatic tension. The debates between realism and melodrama over the years have taught us that one can’t exist without the other. That realism and reality are not one and the same. And yet it hasn’t stopped the filmmakers from striving for realism. Now, there are many ways to look at Ribbon. The manner in which it mediates upon the complexities association with a child’s upbringing, it is bound to remind some of Richard Linklater’s Boyhood. In fact, few would have complained had Ribbon been titled Girlhood, given how a major part of the film deals with the growing up of a girl child. Another way to look at Ribbon is as a film about modern relationships. Also, the film is a critique of the society at large that reminds us about our indifference towards our fellow beings. Ribbon raises several important questions but doesn’t choose to provide any answers. Now, some of the critics have criticized the film for not striving hard enough to provide the answers. But why should we expect the film to feed us with the answers? After all, thought-provoking cinema is supposed to spread awareness. It can make us aware about the problems but ultimately it is up to us to find our own ways to deal with them. For, there can be no universal solution. Now, Ribbon does a good job of drawing our attention to certain important issues that often go unnoticed. Owing to their busy schedules working parents often entrust their children with other people. Who knows if one of them happens to take advantage of the situation? This could be the lift man or the school bus conductor or the helper at the crèche or even the PT teacher. Although, cases of child molestation are not uncommon, not many parents choose to come forward, fearing that it would give a bad name to their family. As a result the offenders go scot-free. Another issue that’s central to Ribbon is the difficulties that female employees have to deal at work, post-pregnancy, especially in smaller organizations. The first step to solving any problem is to be aware of it and a film like Ribbon does a good job of spreading awareness about very many problems that have crept up as a result of modern living. While Ribbon has several merits and succeeds in posing several critical questions, it ends up painting a very gloomy picture of the world we inhabit. Yes, there are problems and there are bad people everywhere but the good certainly outweighs the evil or else the world would have gone down like ninepins. So there is no reason why any of us should lose hope. Moreover, Ribbon’s bleak outlook may unsettle the uninitiated viewer who is accustomed to the escapism of the run-of-the-mill Bollywood films. Having said that, the makers of Ribbon have none the less done a commendable job of making a film that’s highly pertinent to the times we live in. 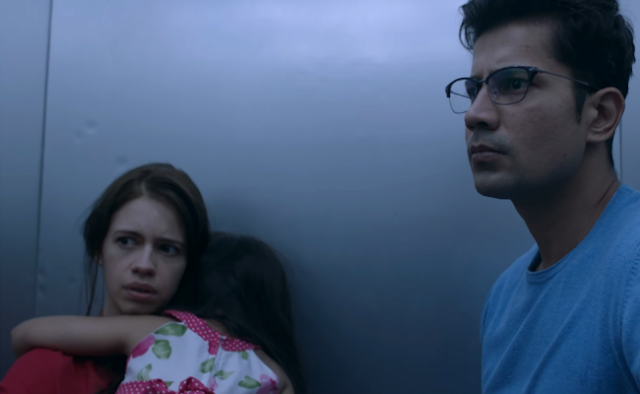 Kalki Koechlin and Sumeet Vyas have delivered strong performances that add a lot of conviction to the film. The fact that the dialogues are mostly improvised speaks volumes about their craft as performers. It’s really heartening to see a relevant and realistic film like Ribbon being made today, far away from the glitzy style of commercial Hindi films.